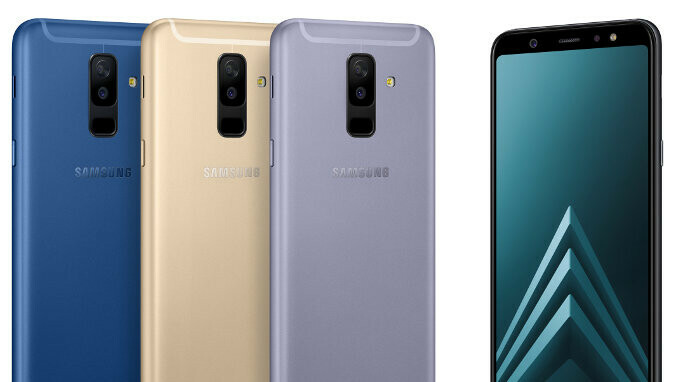 Samsung has just unveiled two new affordable phones and both of them feature gorgeous AMOLED screens - a rarity in cheap phone that usually have LCD displays - with very small bezels, run on the latest Android 8.0 Oreo and come with a focus on camera quality: enter the new Galaxy A6 and the Galaxy A6+. Both new Galaxies look very similar in terms of look and styling, except for the difference in pure size: after all, the A6 comes with a 5.6" display, while the A6+ features a 6.0-inch screen. So what else is special about these two affordable phones? Apart from the beautiful screens, the two come with capable front-facing cameras with a dedicated LED flash for selfie enthusiasts. The most notable difference between the A6 and the A6+, however, might be that the bigger A6+ also comes with dual rear cameras and the second one is used to enable the Live Focus effect for blurred backgrounds in photos, a look similar to what you get on professional cameras. It's a great thing to see this advanced feature in a phone that is not so expensive. The other benefit of buying the bigger A6+ is its larger battery: it has a 3,500mAh cell, while the regular A6 features a 3,000mAh battery. Both phones also come with NFC and Samsung Pay for convenient wallet-free transactions. While Samsung has not unveiled the price for these two, chances are that they will be lower than the upper mid-range pricing of the Galaxy A8 series. The A6 and the A6+ will be available in select countries in Europe, Asia and Latin America from early May. Featuring a powerful front and rear camera, a sleek premium design and Samsung’s signature Infinity Display, the new Galaxy A series is available in four stylish colors; Black, Gold, Blue and Lavender. The Galaxy A6+’s Dual Camera can even further enhance the pictures and moments that matter with Live Focus mode, meaning that users can control the depth of field and bokeh effect before or even after the shot is taken. Users can enrich their pictures with unique background blur patterns in a range of shapes including hearts, stars and more. Users can experience a richer surround sound experience to enjoy movies, music and more with speakers supported by Dolby Atmos optimized audio. The Galaxy A6 and A6+ provide a full range of sound from highs to lows, with outstanding clarity and true-to-life detail for a more powerful and immersive audio experience. Users can choose to turn on the Dolby Atmos effect to transform their audio with breathtaking moving sound that flows around them. The Galaxy A6 and A6+ continue to set the standard for the ultimate uninterrupted viewing experience with Samsung’s signature Infinity Display that goes beyond the bezel, featuring an impressive 18.5:9 screen ratio. Its sleek smooth curves and metal design have been engineered to offer improved durability and comfortable grip for maximum usability, without compromising on style. Both devices make multitasking fast and easy with App Pair, fully utilizing the Galaxy A6 and A6+’s large ergonomic screens by allowing users to pair two apps, halving time and doubling enjoyment. With the Always on Display users can get information at a glance without unlocking their phone, saving on time and battery life. 450$ for this :/ better i add 200$ more and buy S9 Samsung GROW UP! Where do you live? The S9 costs more than $650. It's at least $300 more than the A6. Yeah right sorry my bad :P Still i ll go for Something else but not this. May be Mi A2. If A6 was 1080p I'd buy it. So glad I bought the S7 for $300. All new phones are ridiculous. Stupid aspect ratio, stupid prices. 720p is a dealbreaker imo.